Superb portrait, the shallow dof looks superb! Beautiful portrait; nice lighting and color. I see wisdom and kindness behind this mans eyes. Such an intense portrait. The light really lends to the drama of the shot. great! peaceful and symmetric face .. smooth curves/lines of the chin, lips, eyes and eyebrows which I noticed first .. BRAVO!!! The story behind "Monk in Xigar monastery, Tibet"
This the 2nd in a small series of 3 about buddhist prayers in Xigar (or Shegar or New Tingri), Tibet, a small dusty place in the middle of nowhere. 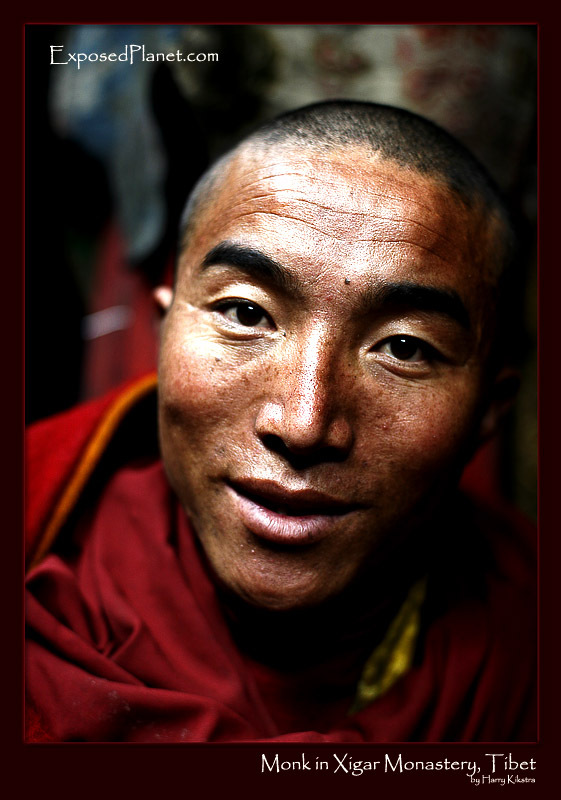 This monk lives in the Xigar Chöde monastery that was built in 1269 in the old part of town, at the foot of a steep hill. This part is named Xegar Dzong or Crystal Fort and the remains are still there. For 10 yuan (about a euro) you can step inside and see the huge old Buddha statue. And if you want to get smart the easy way, you can walk underneath the scrolls with ancient texts of wisdom. These are in a cabinet, with enough space below, so you can carefully walk there. According to this monk, the wisdom would come down in you when doing so.. Couldn’t hurt I think?